A Duke Energy/Progress Energy solar farm. 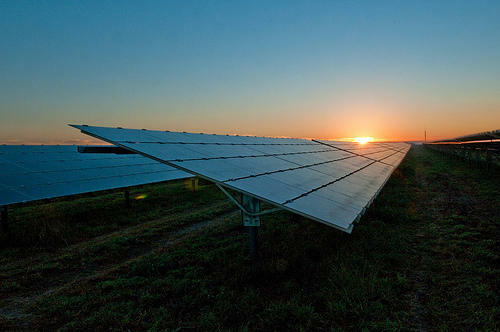 North Carolina’s solar energy industry has garnered much success in recent years – from solar panels to solar farms. In 2012, the state was ranked the 5th Top Solar State in the nation by the Solar Energy Industries Association. And the North Carolina Sustainable Energy Association reports there are more than 15,000 full-time equivalent employees working in the state's clean energy industry at 1,100 companies. But still many local governments, land owners and the general public are not educated on the solar energy permitting process. Tommy Cleveland is a Solar Engineer at the North Carolina Solar Center. He says they hope a special series of forums will address the problem. “What’s happening right now in North Carolina is a very wide range of requirements from county to county and municipality to municipality. And many times because there are no solar specific rules in the county it is difficult to know what the permitting process will be," said Cleveland. Cleveland says a solar template ordinance would make the process more consistent and transparent. The first forum on Solar Development is Friday at the Natural Sciences Museum in Raleigh. Others are set for Greensboro, Lumberton, Asheville and Charlotte. One of the biggest solar farms on the east coast is now generating power for customers of Duke Energy. The joint project with Sun Edison is located in Davidson County. Jason Walls works for Duke Energy. He says the facility will generate enough electricity to power 26-hundred homes. The North Carolina utility company Progress Energy is among the nations leaders in solar production. Last year the utility company produced almost 70 megawatts of new solar generating capacity. The Solar Electric Power Association (SEPA) says that’s the 8th highest output of all U.S. utility companies.